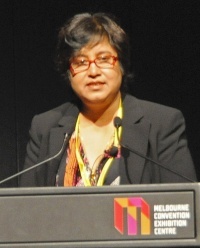 Taslima Nasreen (also Taslima Nasrin) is an author who describes herself as a 'secular humanist, feminist and physician'. 'In the past Muslims invaded countries by swords, now they invade with large population. One of twelve signatories of Manifesto: Together Facing the New Totalitarianism together with Ayaan Hirsi Ali, Caroline Fourest, Bernard-Henri Lévy, Irshad Manji, Taslima Nasreen, Salman Rushdie, Antoine Sfeir, Philippe Val, and Ibn Warraq. The manifesto starts as follows: "After having overcome fascism, Nazism, and Stalinism, the world now faces a new totalitarian global threat: Islamism." This page was last modified on 11 August 2017, at 06:51.